The Bank of America Merrill Lynch Visa Rewards Card is the perfect way for your company to show appreciation to hard-working employees. These cards can be given as incentives to employees who exceed performance expectations or as a token of appreciation. 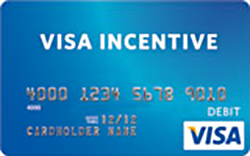 This prepaid Visa functions like a debit card and can be used at any merchant that accepts Visa. It grants flexibility to recipients since they are not limited to specific retail locations, which is typically the case with traditional gift cards. Account activity can be managed online and via telephone 24/7. Why Do Banks Carry American Express Gift Cards? All Bank of America Merrill Lynch Visa Rewards Cards are customizable. Companies can select one of 22 unique designs, incorporate one-color company logos, or design the cards from scratch. Orders with less than 1,000 cards will incur a $250 set-up fee, and any others cost $75.00. If the company wants to completely alter the standard design, the minimum order must be for 10,000 cards. Businesses can also select a message to include on the face of the Reward Card. To order your business reward cards, visit the website or call 1-866-709-8014. The website will prompt you to accept the terms and conditions, create a company profile and select a payment method. You can load any amount from $10 to $2,500 on each card. Payment can be remitted via a wire transfer, ACH transfer, or via a Merrill Lynch account. Cards will be delivered within three to five days after the order is completely processed. The rapid delivery time makes these cards the perfect last-minute gifts to distribute at company events and special occasions. Each card is packaged in an unsealed envelope with the company's name on it. Cardholder instructions, terms and conditions, and a note with the card balance are included in each envelope. New cards can be activated online or by calling 1-866-300-8288. In order to use the card online, you will need to register the card and enter your ship-to address. This will facilitate the replacement process in the event a fraudulent transaction takes place. All cards expire within nine months of issuance. This date is embossed on the front of the card. In addition, cards are not reloadable and do not have cash-back or ATM withdrawal capabilities. In the event that a card is lost or stolen, Bank of America will issue a new card and transfer any remaining balance for a nominal fee of $15.00. Be sure to carefully review the terms and conditions of the prepaid Visa prior to placing an order.